>Melvita GiveAway! $50 Worth of Products On Greening Beauty And Greening Hollywood! Far and away one of the most delightful and dedicated organic skin-care lines to come out of France is Iroisie. Founders Anne Bontour and Jean-Francois Cabos have just launched their product line in the U.S. Lucky US! Creator Anne Bontour was inspired to create a beauty care line from the natural potions and beauty remedies she remembers both her grandmothers habitually dreaming up when Anne would spend summers with them at the Mer d’Iroisie in France’s northern Brittany. She infused one grandmother’s passion for ingredients from the Sea with the other’s passion for ingredients from the “campagne” and voila’, Iroisie was born. 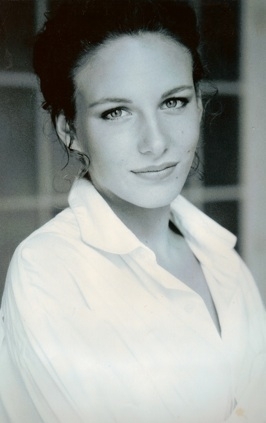 “As ‘homemade’ beauty preparations were my childhood universe, I came up naturally with the idea of developing a real skincare line using both of these two treasures, treasure from the sea and treasure from the earth,” reminisces Bontour, a former model. There was never a doubt in her mind that the line would be entirely organic, as organic has long been her life philosophy. Bontour also maintains that all her products had to smell good, to be inviting to use everyday not just for their efficacy but for the pleasure of texture and scent. The French seem more fond of using nourishing and hydrating oils for both skin and hair. When the oils are 100% organic and natural-based, the absorption into the hair and skin follicles is efficient and leave no trace of oil residue – just silky soft skin and hair! We are a big fan of Iroisie’s Apricot Body Anti-Aging Oil. The scent is ravishingly delicate – sun-kissed and clean with that hint of “Provence” that reminds you of warm summer days and langorous home-from-the-beach afternoons. Its precious ingredients are Apricot, Ylang-ylang, Avocado, Cranberry, and Seaweed Extract. The oil is naturally concentrated in A, B and E vitamins and in essential fatty acids. French women are also known for their sleek and slim bodies. Iroisie can help you achieve this beautiful silhouette with several of their products designed to reduce cellulite and help the body rid itself of toxins. LE CONCENTRÉ MINCEUR: SLIMMING SERUM This fresh and non greasy serum is specially designed for fast and efficient slimming. Results of clinical studies : 98% smoother skin; 78% reduction in “orange peel” skin. These precious ingredients yield extraordinary properties. For example, these marine sourced active ingredients have a concentration 20 times higher for natural anti-oxidants, 80 times higher for calcium and 35 times higher for iron than the active botanical agents commonly used. Iroisie’s active plant ingredients are harvested only from the best organically farmed plants and also in a sustainable way. Their ingredients are culled from crops yielding the highest concentrations in essential nutrients such as vitamins, restorative minerals, trace elements, amino acids, omegas 3, 6 and 9 and powerful anti-oxidants chosen specifically for their optimal performance with skin cell metabolism. Iroisie’s full line of skincare luxury items include facial firming care for face and neck, Botanical Anti-Wrinkle Smoothing Care, Instant Beauty Fresh Mask, Gentle Facial and Eye Cleanser Gel…in other words, you will find a perfect solution for all your skin needs, face and body, with Iroisie. Their white and gold packaging is elegant and understated…and ever so chic! Each Iroisie product is certified organic by Ecocert, Europe’s Top organic certification body which maintains the strictest of standards. All Iroisie products are formulated without parabens, silicones, chemical preservatives, mineral oils, synthetic fragrances/colorants animal extracts, phenoxyethanol or GM ingredients. Iroisie is pleased to gurantee the origins of all their skincare ingredients. Relatively new on the Eco Beauty scene is ekia, the French beauty care line by Carine Mudry, a veteran of l’Oréal, who launched her new regime based on two primary principles: 1. exquisite care for mature skin 2. All organic to the highest standards. So far? Success! Since only April 2009 have the ekia products been on the market in France and already they are carried in major natural beauty care retail outlets throughout Paris and the Provence. Two new products that ekia introduced just this summer are both targeted towards the fragile skin surrounding the eyes: Le Gel Lift Paupières and Le Baume Regard. Le Baume Regard is formulated to revitalize the eye area and can be used to stall the signs of aging in the skin that can surface around the eye area from many factors – not just age – such as stress, fatigue, free radicals, smoking, sun over-exposure and other damaging environmental conditions for the skin. Le Gel Lift Paupieres is a serum formulated to firm and lift the eye area. It works immediately upon application, its concentrated formula giving the eye area a brightening effect that seems to magically remove signs of fatigue. These two products can be used individually and have also been designed to work together. First apply the Gel Lift serum to the eyelids, wait one minute to allow for penetration, and then finish the application to the surrounding eye area with Le Baume Regard. Using the products like this allows for perfect synergy in the ingredients. What is ekia’s “magic ingredient”? It is nothing less than the mythical-sounding “dragon’s blood” or “Sang du Dragon”(in French) which comes from the sap of a tree in the Amazon. This ingredient has been proven to boost cellular regeneration by 40%. The sap is particularly interesting for the skin around the eye area because it is anti-inflammatory and it is rich in polyphenols and anti-oxidants. Click Here for 15% off your next purchase of ekia skincare products. Must mention Greening Beauty, Greening Hollywood or Green Blog Network. In fact, most of the ekia skincare line has at the heart of its ingredient recipe, this Dragon’s Blood, derived from the Croton Lechleri tree in South America. The sap from this tree has been used for thousands of years by the local population to treat all kinds of external and internal ailments, including ulcers. Ekia is one of those rare natural-based, organic skincare lines that has proven its efficacy with clinical tests. The line went so far as to test each line of its products on 150 women, all of whom were 50+ years old over a period of three months. They documented the product’s results using an independent dermatologist and close-up photography that used no lighting effects or photoshop retouching. The positive results on the women’s skin are clearly visible. 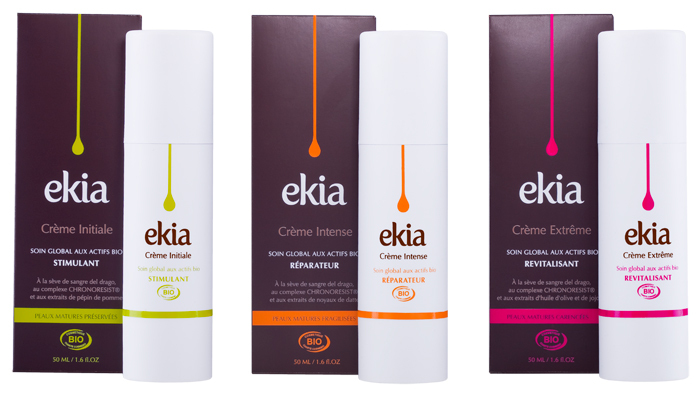 Ekia Skincare comes in three main lines: Crème Initial – stimulating; Crème Intense – Restorative; and Crème Extreme – Revitalizing. In Paris and throughout France you can find the line in all the top organic beauty retail outlets. You can also find it at: www.ekia-cosmetiques.com. Around since the early 90’s, “Nature at Heart,” Melvita is France’s organic beauty brand that has been doing beauty naturally long before green was seen as glam! Walking into a Melvita Natural Beauty boutique in Paris or anywhere in “provence” and you instantly fee like you’re on safe ground.